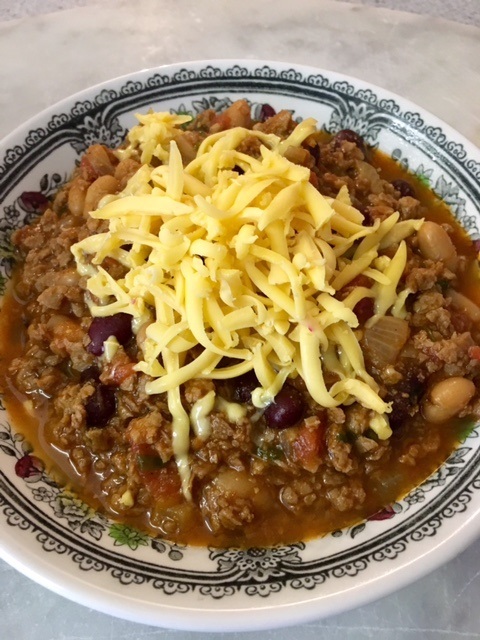 400g dry soya "mince", 1 tablespoon each coriander and cumin powders, 1 teaspoon each oregano, paprika and cayenne, 2 tablespoons chilli powder, 2 chopped onions, 2x 410g tins diced tomatoes, 3 tablespoons tomato paste, 1x 410g tin each kidney beans and baked beans, salt, chopped fresh coriander, grated cheese. This makes a huge amount of chilli so you could easily halve the recipe. Place a large pot of water on high heat to boil. Add 1/2 cup of milk to the water. Add the soya mince and boil for 5 minutes. Then remove the pot from the heat, cover with the lid and let it stand for 20 minutes. Drain the soya mince into a colander and rinse thoroughly with cold water. Then squeeze out as much water as you can. There will be a lot of water so keep squeezing! On medium heat, in a large pot fry the onions in some oil. When the onions have softened add the dry spices. Cook this for two minutes. Then add the soya mince and stir thoroughly. Add the diced tinned tomatoes and the tomato paste. Add two teaspoons of sugar and one teaspoon of salt. Let this cook on low heat for 45 minutes to an hour. Add some vegetable stock or water as needed. Then add the beans (the entire contents of the cans) and cook for a further 15 minutes. Check for seasoning, add salt if needed. Stir through the chopped coriander and remove from the heat. Let the chilli stand for 15 minutes before serving. Serve in a bowl topped with grated cheese. It's great on it's own but you could serve it with rice or tortilla chips. Enjoy!